As I noted back in January, 2017 is an interesting year for OLED TV fans because we’ve not one, not two, but three TV manufacturers peddling their OLED offerings. 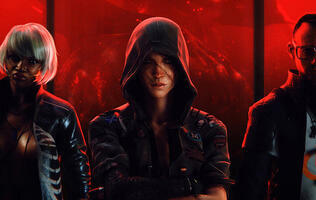 They are: LG, Panasonic, and Sony. The Sony Bravia A1 was officially launched in February (though it has yet to arrive in stores), and earlier today, it was LG’s turn to reveal its OLED TV master plan for the Singapore market. 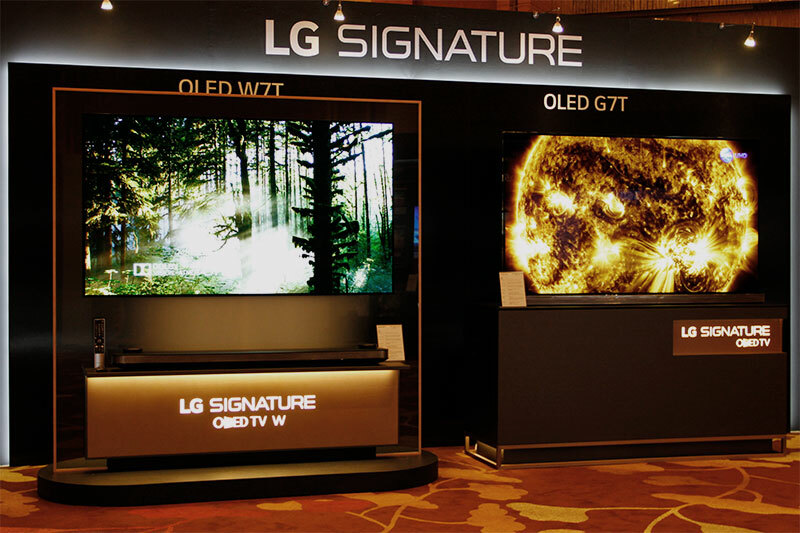 To cut to the chase, leading LG’s OLED TV charge this year are two TVs in the Signature series: the Signature W7T and G7T. 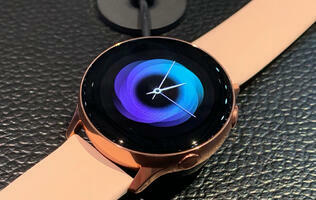 Of the two, the Korean company is trumpeting the W7T more. Why? Because this wallpaper-thin TV is an entirely new model, unlike the G7T, which for the most part, is an upgraded version of the excellent G6T from last year. The non-Signature E7T, C7T, and B7T are, as you’d have guessed, successors to last year’s E6T, C6T, and B6T series; and between them, their differences mostly lie under the hood. Higher brightness than the 2016 models - According to LG, peak luminance for its 2017 OLED TVs tops out somewhere between 900 to 1,000 nits, which is great news if you’re into HDR (high dynamic range). But the caveat is this is only achievable with the Vivid picture preset and in a 5% (or less) window. Overall, the new TVs are about 25% brighter than their 2016 siblings, and this improvement will benefit both SDR and HDR videos. Four HDR formats - All of LG’s 2017 OLED TVs support four HDR formats: the open HDR10, Dolby Vision, and HLG (Hybrid Log-Gamma) out of the box, and Advanced HDR by Technicolor with a firmware update coming in the second half of the year. Now, HLG is designed to easily enable live HDR broadcasts, but such broadcasts aren’t expected anytime soon. So until then, this is more of a future-proofing feature. The same can be said for Advanced HDR, a format based on Technicolor’s HDR distribution system. 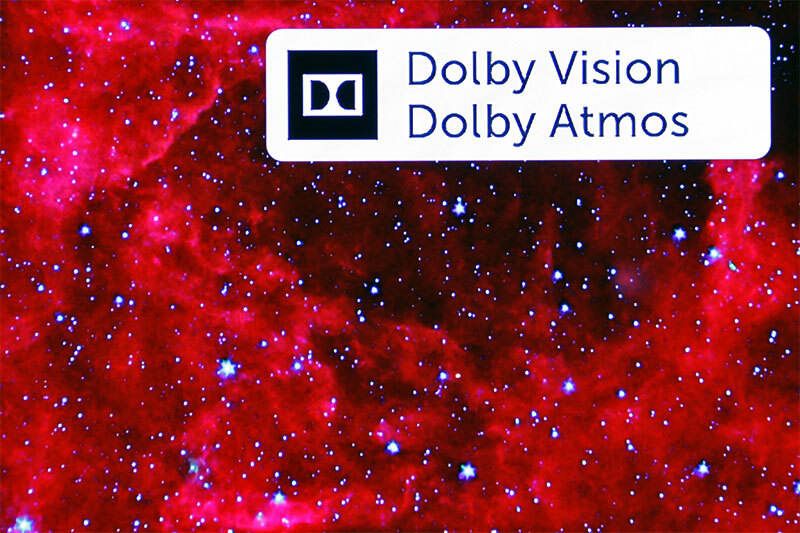 Dolby Atmos - Another major addition to this year's OLED TVs is the support for Dolby Atmos surround sound. 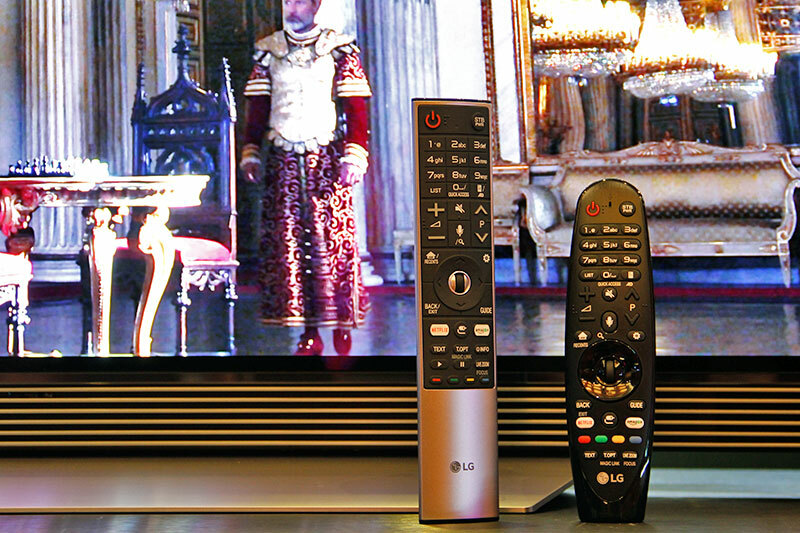 Unlike the 2016 models, the 2017 TVs support Atmos-enabled Dolby Digital Plus streams over the HDMI ARC (Audio Return Channel) connection. This means you can easily pass DD+/Atmos soundtracks from TV apps (e.g., Netflix, VUDU) or external boxes connected to the TV to an Atmos-enabled AVR (audio/video receiver) over HDMI ARC. That said, know that only the W7T gets its own separate, upward-firing soundbar; the G7T and E7T’s soundbars are still integrated at the bottom of the sets like their predecessors. 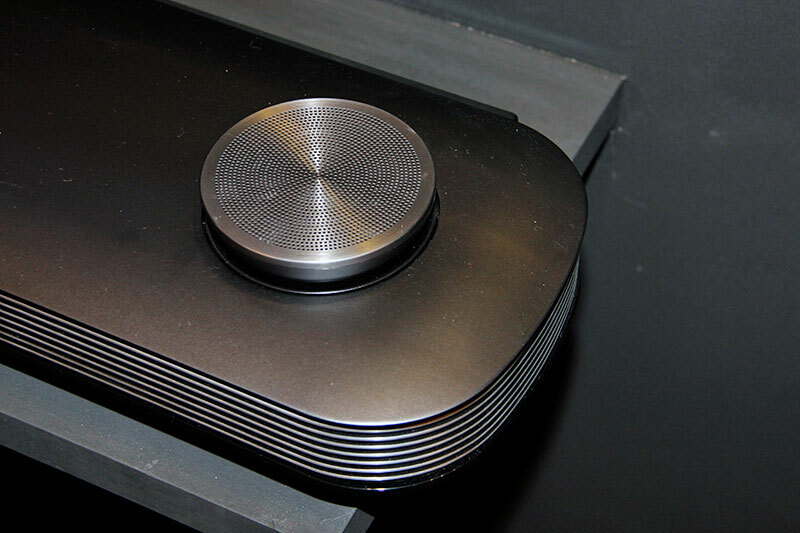 From my brief listening experience, while all three sounded good as far as TV soundbars go, the W7T’s twin roof-firing speakers did make a difference: the 2.0.2 Atmos config simply created more depth and greater realism. Lastly, the C7T (and B7T, which wasn't shown at today's launch) has its speaker units built into the chassis. 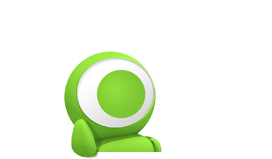 They’re capable of Atmos decoding too, but don’t expect the stereo sound to rival that of a proper Atmos-enabled soundbar or surround speaker setup. WebOS 3.5 - All the new OLED TVs run the WebOS 3.5 smart TV platform. With a faster SoC, the TVs are quicker to turn on and have all the horsepower needed to handle the various HDR formats and processing smoothly. There’s also a new Magic Remote with dedicated Netflix and Amazon Prime Video buttons. 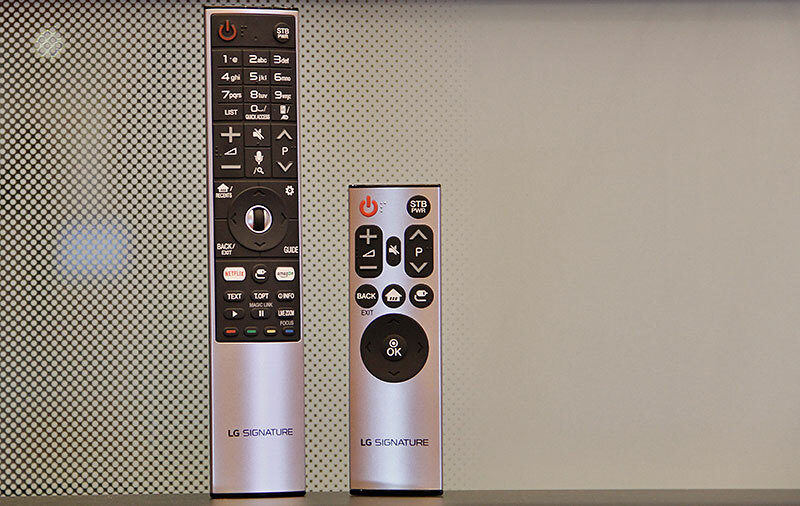 You can even use this remote’s built-in microphone to optimize the TV’s sound and its arrow buttons to explore a 360-degree video. All the OLED TVs are flat - The 2017 OLED lineup has no curved models. While last year’s C6T is a curved TV, this year’s C7T is flat. 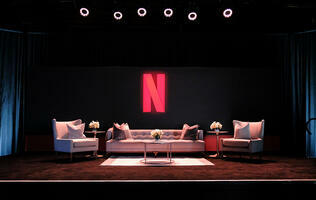 3D is dead - None of this year's OLED TV models support 3D. If for some reason you must have a 3D OLED TV, I suggest you turn to the 2016 lineup. So, what's so special about the Signature W7T that warrants its S$12,888 price tag? And do I still need to break the bank if I'm going for the other series? 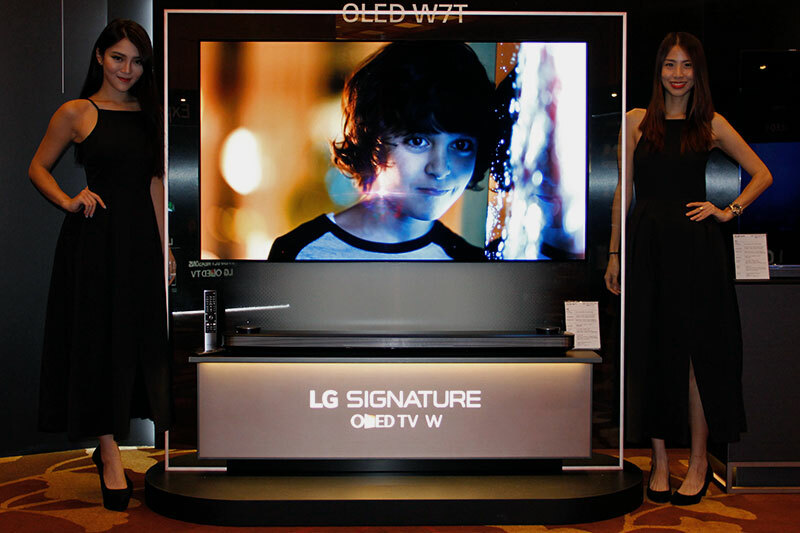 As I mentioned earlier, of the new OLED TVs, the Signature W7T is the one getting the most love and attention. And that’s primarily due to its crazy-thin design. Measuring just 2.57mm thick, the W7T screams to be hung on the wall. In fact, with no tabletop mount option, that’s the only way to set up this “wallpaper” TV. 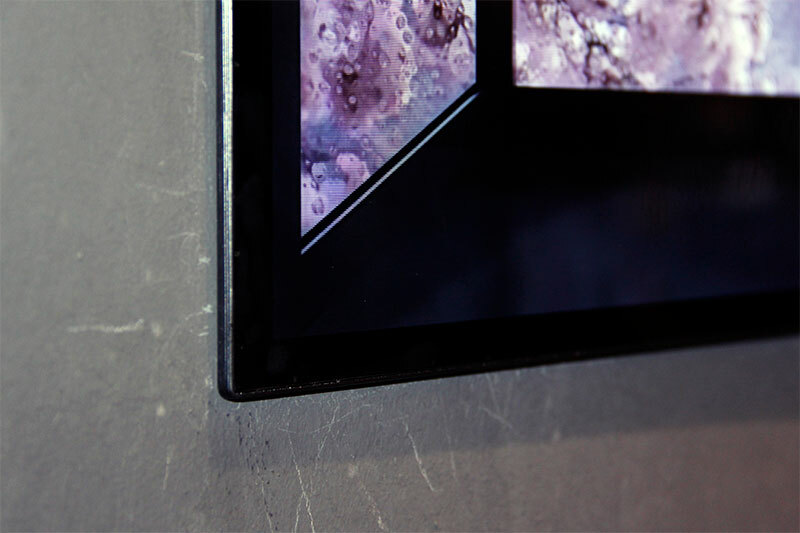 When wall-mounted with the included ultra-slim magnetic brackets, the TV protrudes a mere 4mm from the wall. Put simply, if you’ve always wanted your TV to look like a wallpaper, a window, or something that will elicit a wow from your guests, this is it. To get to this thinness, LG has to pull out most of the TV’s processing guts and ports and place them somewhere. And that somewhere is the 4.2-channel soundbar that comes with the TV. On it you’ve four HDMI connections, three USB ports, and one optical audio input for your modern source devices, along with the usual fare of RF, composite, LAN, and RS232C jacks. 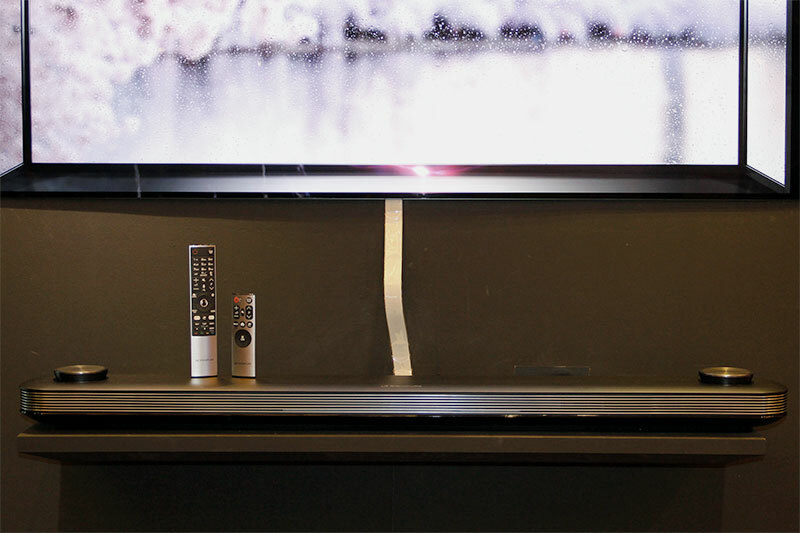 A single cable is used to connect this soundbar to the TV; and while it looks fairly discreet, it’s best hidden behind a feature wall if you’re striving for the cleanest look. The LG Signature OLED W7T will only come in a 65-inch screen size, and this S$12,888 OLED TV is due to arrive in stores in May. 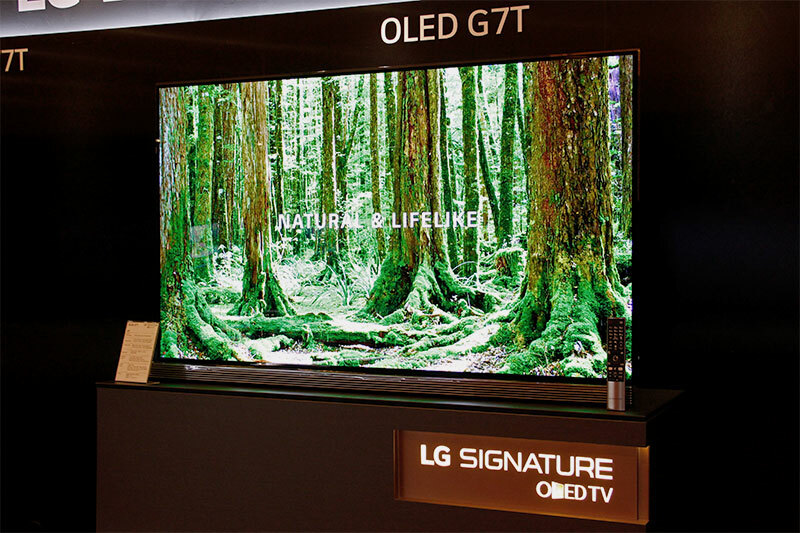 The Signature G7T is available in 77 and 65-inch versions, and both are expected to also hit stores in May, but pricing has yet to be announced. 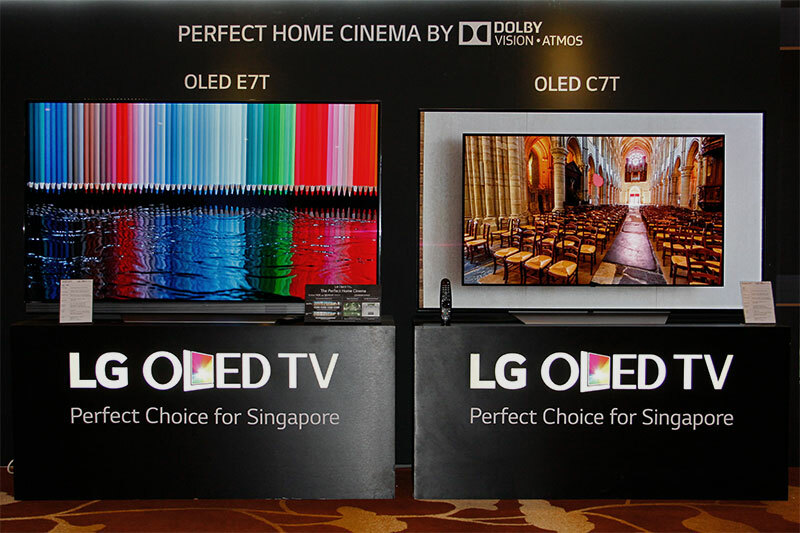 Meanwhile, the E7T and C7T series are available in both 65 and 55-inch sizes. The E7T will go on sale in May too, but the C7T is already available, with a starting price of S$4,688. Note that the availability of the "entry-level" B7T wasn't part of today's announcement, but I was told that it'd arrive later this year. If anything, it's worth pointing out that the W7T now occupies the price bracket of last year's G6T, which is good news, as this implies this year's G7T will start at a lower price than the G6T when it first launched. In fact, this year's flat C7T is anywhere between S$1,700 to S$2,100 cheaper than the launch prices of the curved C6T last year. Perhaps more importantly is that unlike last year, we've in the C7T an OLED 4K TV that's more affordable than even Samsung's flagship Q9 QLED TV. We're living in interesting times, people. Update, July 12: Updated specs sheet to include latest prices.